The project, completed in Los Gatos, CA, included a pool deck divided by a 3deep jointed diamond grid pattern. It was integrally colored with Sandstone Color Hardener and Weathered Sage Release Agent using Italian Slate stamps, with Random Connecticut Bluestone bands. The pool coping, seatwall caps and wall caps were all colored with Sandstone Color Hardener, and a sandwash finish. The seatwalls were also poured with concrete and stamped with Italian Slate. 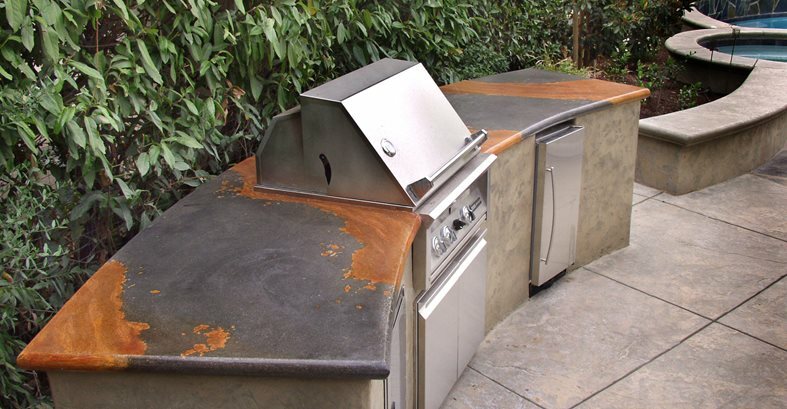 The outdoor concrete countertop utilized three acid stain colors on white cement poured adjacent to black concrete. 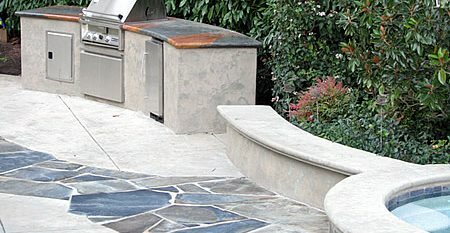 The built-in bar-b-que has a vertical face stamped with a thin topping, and stamped and colored to match the deck. 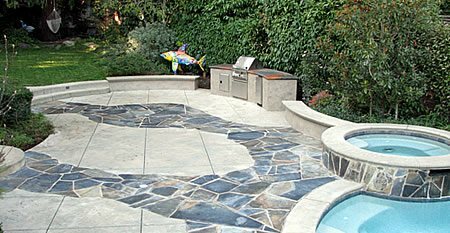 Tom Ralston of Tom Ralston Concrete in Santa Cruz, Calif., sent in these photos of a backyard that got all the concrete treatment. Using a variety of color combinations, designs, and different textures, Ralston was able to incorporate concrete into nearly every element existing in the backyard. The result? A one-of-a-kind retreat, exquisitely designed for outdoor enjoyment.